Using a saucer as a template, draw 6 circles onto the pink felt and cut out. Using the scissors cut a spiral into the circle, working from the outer edge in towards the centre and leaving a small round section at the middle of the circle. Starting with the outer edge of the spiral, begin rolling the felt up so that the flat cut edges align. Use a few dabs of hot glue to secure the felt in place as you neatly wrap it around top to make a flower. When the whole spiral has been secured, add some hot glue to the circle that was at the centre and fix into position onto the base of the flower. Repeat to make five more flowers in the same way. From the green felt use the template and scissors to cut out 10 leaf shapes. From the adhesive felt use the template to cut out the word Home. Place two sheets of white felt together and glue in place with hot glue. Use the scissors to cut a small triangle or another shape, to the lower part of the banner. 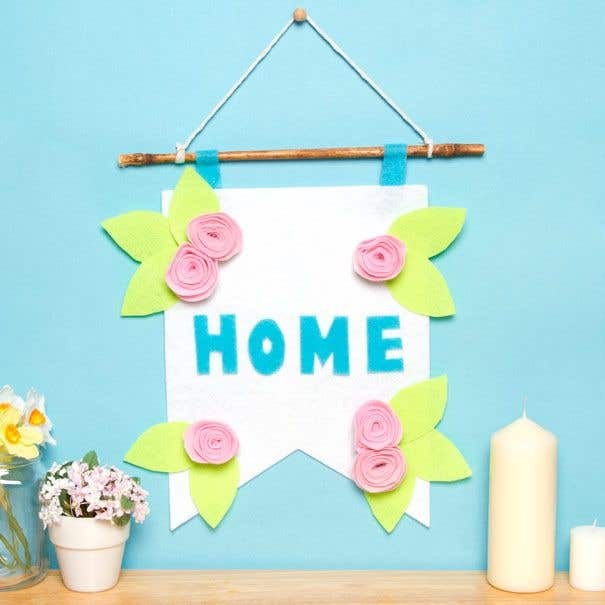 Arrange the leaves, flowers and letters to the front of the banner and, when you are happy with the placement, use the hot glue to secure the leaves and flowers and remove the backing paper to secure the letters. Trim two 2 cm x 8 cm strips of adhesive felt and secure 2 cm to the front of the banner, 3 cm in from the side, turn the banner over, place the bamboo stick onto the strip and secure 2 cm of the strip to the back of the banner. Repeat to secure the stick to the banner at the other side in the same manner. Trim a 20 cm length of twine/string and knot to each end of the bamboo stick to make a hanging loop. It is not essential for the spirals cut into the felt to be identical, as this will create more individual looking blooms, so you can cut these freehand if you like.